Imagine if Cecil Taylor, Ornette Coleman, Jack Kerouac, Luis Buñuel and Jackson Pollock joined Howlin’ Wolf’s blues band. The result would probably sound like something resembling Trout Mask Replica. Exuding a disjointed zaniness, the Captain [a/k/a Don Van Vliet] was unlike anything else out there. One of the watershed recordings of the 20th Century, this is essential listening (though his debut Safe As Milk makes the best introduction). Though the Captain pays respect to free jazz legends, it is more a slapstick homage. He plays two saxophones simultaneously (vaudevillian and/or Rahsaan Roland Kirk-style) on “Ant Man Bee.” This happens while he manipulating textures like early Steve Reich compositions. While he couldn’t really keep up in a free jazz group, the point is that no one had ever combined such seemingly disparate elements into a package so moving. Beat poetry is subtly and perfectly delivered over a variety of backdrops. Desert-styled blues on “China Pig,” “Dachau Blues,” and “Orange Claw Hammer” highlight the backbone of Trout Mask Replica. Twisted gospel on “Moonlight On Vermont” makes it a standout song. Most of the material doesn’t make sense out of context though. The lengthy 70+ minute album must be digested together. Comparing “Frownland” to “Veteran’s Day Poppy” shows the range in just this one album and why it takes time to absorb. The most interesting aspect of Captain Beefheart is his zany, surreal approach to American music. A child-like determination fuels his humor. He tackles difficult topics without sacrificing an underlying idealism. His commentary is poignant and always deeply respectful. The clarity of his vision is what seems so unreal. Captain Beefheart was a child art prodigy almost from birth. He only attended school for a half a day of kindergarten. He brought an outsider’s perspective to the table. 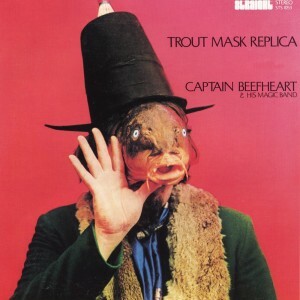 Trout Mask Replica is music the Captain wanted to play. It takes advantage of every bit of his abilities. This is Captain Beefheart’s masterpiece. It is a testament to total creative control (Frank Zappa produces, but this one goes beyond Zappa’s world). The Captain’s debut hinted at British Invasion blues-rock. This sophomore effort can only hint at some other dimension of music. The ingredients sound familiar but the soulful mixture is unique. Arty experiments and beat poetry never quite found a stage so absent of elitism. Trout Mask Replica is the kind of album that doesn’t get old.